In our commitment to deliver only the finest products that will fit your needs, we reviewed 5 of the top body washes made for people with skin sensitivities. These products were then ranked from highest to lowest based on their ingredients, compatibility on the skin, and their price, until we determined what we think is the best body wash for sensitive skin. For an all-in-one product, try the Sensitive 3-in-1 Body Wash by Nivea Men. Dye- and soap-free, it effectively removes sweat and dirt without drying out the skin. 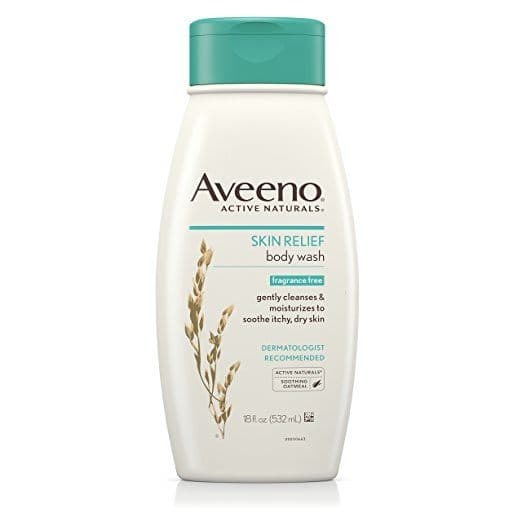 Aveeno’s Skin Relief Body Wash is a dermatologist-recommended brand. Infused with Colloidal Oatmeal, it soothes the skin and locks in moisture for supple skin that lasts the whole day. 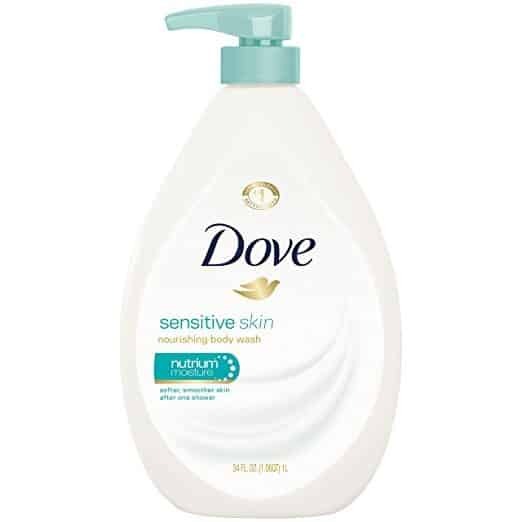 The Sensitive Skin Body Wash by ﻿Dove is a brand recommended by dermatologists. Soap-free, it boasts of its NutriumMoisture technology that seals in the moisture to prevent dryness. Try Kiss My Face’s Sensitive Type Bath and Body Wash for a gluten-free and Vegan product. Made with plant-based cleansers, it helps soothe dry skin with its Aloe and Olive Oil contents. Go for the Liquid Face and Body Wash by﻿ Sebamed for a product that matches the skin’s pH. It is dermatologist-recommended, non-comedogenic, and 100% alkali- and soap-free. This is the best body wash for sensitive skin because it contains no alcohols. It is also dye and soap-free, and offers superior cleansing without being too drying and harsh on the skin. Formulated for men, this body wash can be considered as a unisex product. It has a pleasant smell that’s not too overpowering, and does not leave a residue on the skin after every wash.What makes this body wash great is its bamboo extract content. Full of antioxidants and anti-irritant properties, it helps fight the signs of aging as well as soothe irritated and inflamed skin. A 3-in-1 product, this body wash can also be used as a shampoo. It cleanses hair without over drying it, and even conditions hair unlike other brands that leave it coarse and lifeless. For the hair, the benefits of bamboo extracts include removing dead skin cells and help keep the hair ducts clean. This product, however, contains fragrance. We all know that fragrance can irritate sensitive skin, so if you are decided on using this product, better use it with caution in mind. Being hypoallergenic and fragrance-free are what make this the best body wash for sensitive skin. Creamy, it gently cleanses the skin and helps lock-in moisture to calm irritated skin. The secret is in its Colloidal Oatmeal content. Rich in antioxidants, this ingredient has been used for a long time because of its skin protectant qualities that benefit those with sensitive skin. Additionally, oat baths have been used since the time of the Romans and the Greeks to heal various skin conditions.Dye and soap-free, this body wash is also packed with emollients. Emollients help seal-in moisture even the product is rinsed off to leave it smooth and soft the entire day. Dermatologist-recommended, this body wash helps in restoring the natural pH of the skin. Plus, it aids in maintaining the moisture barrier of the skin to prevent it from dryness and flaking. The bad news is, this product contains Sodium Laureth Sulfate. Although a good foaming agent, this ingredient can damage the skin, can cause eye damage, and can even damage the liver. Recommended by dermatologists, this soap-free and hypoallergenic body wash boasts of its NutriumMoisture technology. This stops dryness by maintaining the moisture barrier of the skin. And have we mentioned this body wash is also a best-seller on Amazon? Mild and gentle, this product’s cleansers wash the body without stripping it off of its natural moisture. It has natural moisturizers that go deep for soft and supple skin you can actually feel. Easily absorbed by the skin, this product does not leave a soapy residue behind. Unlike others that sit on top of your skin, this wash rinses easily and leaves you with just healthy-looking skin. An exciting thing about this product is it promises visible results after the first wash itself! It also comes in a pump bottle, which we think is a more economical way of dispensing the product. We also love the cause the company supports. It founded the Dove Self-Esteem Fund, a cause that provides self-esteem tools to make women and young girls feel better about themselves. Fans of natural products would love this body wash. Vegan and cruelty-free, this gel-like body wash is made from natural-based cleansers and Aloe Vera and Olive Oil to hydrate dry skin. Free of chemicals, this product contains bergamot, jasmine, and lavender to ease the mind and soothe skin. It also comes in a pump bottle, and its bottles are made from recyclable materials. It also comes in a huge bottle, to ensure a greater value with less waste. This natural body wash combines aromatherapy with hydrotherapy. Aside from smelling great, this product leaves you ready to conquer the day with a smell that’ll leave you very kissable. Used in several skincare products, this body wash also contains Allantoin. Great for dry skin, this ingredient acts as a moisturizer to prevent minor skin irritations and scaly and rough skin. Made in the USA, this product has been in the market for over 30 years. It doesn’t contain SLS or phthalates, and are committed to give you effective products without damaging the earth. Recommended by dermatologists, this body wash is 100% alkali and soap-free. It also has a pH level of 5.5, which is basically the same pH of healthy skin. Non-comedogenic, this body wash cleanses deep down the pores without leaving it dry or irritated unlike your ordinary soap. It is also ultra-gentle, and can be used on the face as well. This product contains Pentavitin and Allantoin—two natural moisturizers that leave skin smooth and soft. It also contains panthenol, a moisturizer that boosts the skin’s elasticity and hydration. A little of this product goes a long way, and one small drop is enough to clean the hands, neck, and face. It comes in a bright green liquid, and can also be used as a makeup remover. Because it is a soap-free, it doesn’t create a rich lather and hardly produces bubbles. It doesn’t leave skin tight or dried out, perfect for those who hate feeling tight after cleansing the face. The best part is it comes in a pump bottle. As we always say, this makes the product more economical and hygienic to use. Visiting the soap aisle can be intimidating, especially now that there are several bar soaps and body washes available. Are body washes as effective at cleansing as their solid counterparts? Let’s go ahead and list down its benefits. It’s easier to produce a thicker lather with body washes. Though a thick lather doesn’t mean it’s effective at removing dirt, a soap that creates a thick lather is still preferred by most people. They are more moisturizing. Since body washes have greater amounts of moisturizers than bar soaps, they are seen to be gentler on the skin and won’t remove the skin’s natural oils. Usability. Body washes can easily be squeezed off the bottle, whereas bar soaps tend to slip off your hands and worse, go down the drain. But there are disadvantages to body washes, too. First is they’re not environmentally-friendly. The plastic bottles where body washes are kept are usually not biodegradable. They’re not economical. You might pour out too little or too much body wash—either way, both lead to wastage. Additionally, products marked as “unscented” may not mean they’re fragrance-free—it might only mean fragrance was added to cover the natural scent of the product. Deodorant or antibacterial body washes should also be avoided. Most of them contain Sodium Lauryl Sulfate—though great at removing oil and dirt, it can strip off the skin’s protective barrier. The way you take care of your skin also matters. Over-exfoliation or excessively hand washing with a loofah or washcloth can break down the skin’s barrier. Which then leads to sensitivity. Picking a body wash that’s right for you can be confusing. Aside from having a lot of options to choose from, you don’t know which ones are worth the investment and which ones are not. But hey, that’s why we’re here. We’ve chosen the Sensitive 3-in-1 Body Wash by Nivea Men as the best body wash for sensitive skin in this round. With bamboo extracts, this alcohol-free product effectively cleans the skin without drying it out. It is also a 3-in-1 product, and can be used on the body, as a shampoo, and to soothe skin. This product lathers up well, and can be rinsed off easily. There are however two downsides (which we could think of) to this product. First is it contains Sodium Laureth Sulfate, and second is that it is not fragrance-free. But it doesn’t seem to be a big deal, since a lot of customers still swear by it.